Dual 6" duct in an 8" system? Derick Greenly wrote: All very chewy food for thought. But two six inch pipes have a csa around 60. Is combining into a single stack a necessity? best thing is build a mock unit outside and test it. sounds like you have already made your decision... go for it brother. Very astute! Head like bull. All very chewy food for thought. But two six inch pipes have a csa around 60. Is combining into a single stack a necessity? Given that used 6" duct is about 1000x as available as 8" on the freebie market, and the former has about half the CSA as the latter, could one not just run two parallel 6 inch pipes ( simple, single run, no elbows) out of the manifold and through the mass, then both outside? Would the increased surface area necessitate a slightly lessened maximum duct run? Thanks! Yes! Or a shot of buttermilk. But lactobacillus is so prevalent in breweries and grain mills, the starter is mostly for your peace of mind. Success is the norm here. It's a great excuse to pick up buttermilk and throw a pancake party, though. Pigs are the great waste eliminators of the homestead. I'd like to weigh in with my experience from the past year, when my employment at a microbrewery made pig raising several times more viable and low on purchased inputs. The brewery uses 16-19 55lb. Bags of malt every brew. Being vexed and perplexed by the speed at which BSG turns mouldy and smells like feet, I sought storage techniques approachable at the medium-scale level. Drying was one, in which malt was raked out on a flatbed, raked twice on a sunny day and placed in the granary. Formidable, but I have no flatbed, nor any granary. A few documents mentioned "ensilage", or anaerobic fermentation, similar to corn silage done in big plastic worm bags. Thus, my curiosity was piqued. I now ferment all my grains, feeds and spent malt in 55gal. Plastic drums, covered in fresh water. Addition of sugars, such as scrap wort available to keen brewery workers after the boil, only accentuates the ferment and, I think, offsets some of the disproportionate fibre which is so notoriously problematic. Storage without any off smells (besides pickly beer) is boosted to about 3 weeks in broad August sunlight, and indefinitely in cold months. Colour me a convert. I wonder also if the ferment makes the malt more digestible. It certainly sharpens porcine appetites. Though all-organic breweries are scarce, I seem to recall that the brewing industry has its own strict standards set out which greatly diminish the nasties that may be sprayed on barley. Can anyone weigh in here? A dozen heartfelt appreciations for your patience for having read this far. One very critical change incurred when we went into the spawnhouse with this system is that the ceiling is a few hairs short of six feet. this means our 29-inch 35-gallon barrel must be able to clear the top brick of the heat riser, which a 40-inch riser would not allow. the compromise is that we'll have a shorter riser than in perfectly ideal-somewhere around 35.5 inches. still not project-shattering. the burn tunnel will be in the neighborhood of 16 inches, and the feed tube, though it is around 16 inches in the pictures above, will be shortened to 12 inches or so tonight. One footnote: there is also the option to create a 12x4.5 inch notch in the barrel, just for the purpose of passing the barrel over the riser, which I could then build to 40 inches even. This would necessitate a dreadful amount of sealing and reworking around the barrel once placed, as opposed to the nice knife edge seal I will have by keeping only a 9x3 notch cut out of the barrel. This notch will tuck onto the bricks forming the ceiling of the burn tunnel. This notch is to obtain that 2" gap between the heat riser's summit and the barrel's inner surface that's known to be so spiffy for cooking. If the notch were omitted, the gap would be 5" and the cooking potential would be nil, no? Manifold: I obtained a nice truckload of freebie broken clay bricks from a demo in a neighboring town. My intent is to build a brick plinth ringing the area below the barrel, exhausting into a 1-foot section of stove pipe, then a cleanout tee, then the mass. This is the week that I'm full steam ahead on the heater. Daily routine will be (in order): feed the pigs, feed the ducks, collect eggs, poke some seeds in the garden and FLOAT THAT TROWEL! 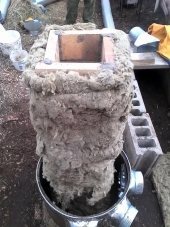 To avoid spalling of the concrete below, we raised the floor of the heater by one course of red brick and stuffed shredded roxul in there as a bonus. There is also a tinfoil floor, but i won't sing its merits too heartily. Aye, aye, aye. The spawn house, which I was hoping to have online by this time, has had its share of unforeseen hurdles which offered opportunity for optimization of the design as a whole. Most notably, the lab will remain in a walk-in closet in the farmhouse indefinitely, the aisle of the silo base will be the main heat source and incubation area, and both bracket rooms will serve as fruiting areas. If the season necessitates it, the west (left) bracket room may be used as an earth-sheltered cold room with a coolbot, while fruiting can move to a simple hoop house. Yeah, the heat sink:mass spectrum is the core of my uncertainty about the thing. I'll proceed with a dry stone mass until in proves itself, then cob it in for good. I suppose I need to see how warm each area gets with my own two peepers before I decide which rooms will be for incubation, fruiting and lab work. It's going to be a n 8-inch, all firebrick-cored, rockwool wrapped, 45 foot drag ducted RMH. Options to either use a plain ol 55-gallon oil drum or a 30-gallon shiny stainless catnip oil drum are being dissed out today, but I've my doubts about the latter.